These are extensions of the program's functionalities, for reporting, calculating, exporting, importing, establishing bills and reminders and other. They need to be set up by the user by clicking the appropriate button in the Manage Apps dialog from the Apps menu. 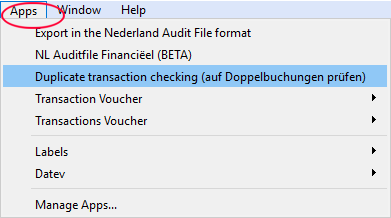 Execution takes place via the Apps menu or within the specific functionality (for example: Import into accounting). The Apps menu lists all the already installed BananaApps related to the file that is open at the moment. By selecting the command, the indicated App will be executed. The Manage Apps... command allows you to search for, install, alter your settings or uninstall BananaApps. For installing a new App, visit our page Manage Apps... . They are very secure and cannot perform functions that might an impact on the operating system. A compressed file with the .sbaa extension, which can contain several other files, necessary for the application, such as commands, images, dialogues. A package can contain several commands. The title of the package and the commands it contains are indicated in the Apps menu. If you disable a package, all Apps will be disabled. The commands for running BananaApps are only made available if the current file (the one on which you are working) has the features required by the Apps. If an app is not visible in the Apps Menu or is not executable, it will be because none of these features are present . Commands that can be recalled in the Apps Menu. Available via the Import into accounting command. Available in the Apps menu. The user should define the file name at the end of the process. Prepares the invoices to be printed. Available via the Print invoices... command (Account2 menu -> Clients). Prepares the reminders to be printed. Available via the Print reminders... command (Account2 menu -> Clients). Prepares the statements to be printed. Available via the Print statements... command (Account2 menu -> Clients). Association via a File Type. This requires the current file to be - for example - an Accounting file, or the double entry file, or addresses. Some Apps will only be executable if the relevant word is specified in the File properties, Other section (from the File menu). For example, the List of Administrators to be printed, that require specific fields, will require the word "Administrator". Anyone can create BananaApps that extend the functionality of the program. However, programming fluency is required..
To develop a Banana application, it is recommended to set out from an existing project. Please refer to the developer documentation. Install the application via the Manage Apps command (from the Apps menu).